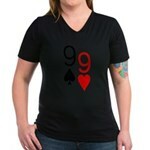 Shop for Custom Poker Shirts for the Holidays. This is one of the recent custom designs we made for our customers at no additional charge. Do you have a specific hand in poker that you like? Are you looking for new poker stuff to buy? If you want custom gift items you can make a comment in this post and we will create it for you. You may also use the suggestion box on the site as well. Most custom designs are created within 24 hours of your request. This is our latest request. You can find more pocket pair poker shirts on the site by clicking here: Pocket Pair Poker Shirts. If you would like to browse our Pocket Nines Shirts, click the image on this page or click here: Pocket Nine Poker Shirts.